Obama is the worst jobs president since the Great Depression. 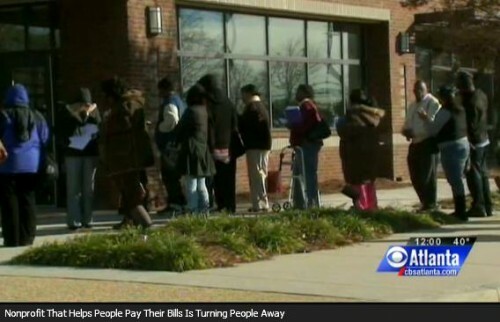 More than 40 million Americans are now receiving food stamps, a record. Thanks to Obama’s failed economic policies ony 38,000 private sector jobs were created in May. Obama depression lines form in Georgia in December. A chief economist today announced that we are on the verge of a Great, Great Depression. Wall Street is having a hard time figuring out what to do now that the U.S. economy appears to be sputtering and yields are so low, Peter Yastrow, market strategist for Yastrow Origer, told CNBC. “What we’ve got right now is almost near panic going on with money managers and people who are responsible for money,” he said. “They can not find a yield and you just don’t want to be putting your money into commodities or things that are punts that might work out or they might not depending on what happens with the economy. Stocks extended losses after the manufacturing fell below expectations in May and the private sector added only 38,000 jobs during the month. “Interest rates are amazingly low and that, thanks to Ben Bernanke, is driving everything,” Yastrow said. “We’re on the verge of a great, great depression. The [Federal Reserve] knows it.